UNCG will hold Veterans Day activities on campus Friday, Nov. 11, starting at 10 a.m., and there will be a special program on the lawn between College Avenue and the Minerva Statue at 1:30 p.m.
Flags will be set up on the Kaplan Commons lawn to create the Field of Honor, and military recruiters will be on campus, with promotional vehicles. The Marine Corps will offer a combat fitness test, and the Student Veterans Association (SVA) will host an MRE sampling, for those who would like to taste field rations. The events will be held in front of Jackson Library. The 1:30 p.m. program will include speakers, such as Major Michael Linnane, a moment of silence and the National Anthem, performed by the UNCG Spartones. A student veteran, David Zochol, will read an essay about his experience overseas, and the U.S. Air Force will conduct a swearing-in ceremony for several students. The program will be followed by a reception at the UNCG Veterans Resource Center for special guests, student veterans and their families. Throughout the day, there will be a card-signing table for veterans, sponsored by Staff Senate and the SVA, in the EUC Commons, as well as a display table for the Women’s Veterans Historical Project. At the evening UNCG basketball game against Virginia, the 82nd Airborne Division All American Band from Fort Bragg will perform the National Anthem and a military medley at halftime. Paul Chelimo, a UNCG alumnus, silver medal winner in this year’s Olympics and active military member, will be in attendance. The game will be held at the Greensboro Coliseum at 7 p.m. and free tickets are available at the game for military ID-holding student veterans and their families. For more information on tickets, contact Adam Rich at alrich@uncg.edu or (336) 334-3250, or visit the UNCG Ticket Office in the Coleman Building. Updated with new information Nov. 7. With less than one week before the campaign wrap-up event, the UNCG State Employees Combined Campaign (SECC) is approximately $45,000 away from reaching its goal of $199,999 raised for charities. On Monday, campaign chair DiAnne Borders sent a message encouraging faculty and staff to give back through the SECC. Borders also mentioned the drought that continues to impact our neighbors in western North Carolina, as well as local news reports that highlight the challenges – such as poverty, homelessness and domestic violence – in our own community. “If you have not yet had the opportunity to pledge, we hope you will identify the cause(s) that speaks to your heart,” she wrote. The 2016 North Carolina Dance Festival, a 26-year-old annual showcase of modern and contemporary choreography by N.C. artists, will bring a meaningful closing performance to Greensboro November 12, after stops in Raleigh and Boone. The performance will inaugurate the Van Dyke Performance Space, a newly created black-box theater in the Greensboro Cultural Center. The NC Dance Festival has strong roots in UNCG’s dance department, and involves the efforts of many UNCG alumni. It is a program of the Dance Project, a non-profit organization founded by the late Dr. Jan Van Dyke, a celebrated choreographer, teacher, and community leader, a long-time faculty member and department head in the UNCG Dance Department, and an alumna herself. It has been operating in North Carolina since 1989, and it is now directed by Anne Morris and Lauren Joyner, both UNCG alumni. As part of the performance, UNCG MFA graduate Danielle Kinne will premiere “Greensboro Moves,” a new work made possible by a Spark Fund Grant from Action Greensboro and DGI. To produce this piece, Kinne and her dancers, also recent UNCG alumni, drew inspiration from members of the community at public events and local schools. Also performing is UNCG alumna Alexandra Joy Warren, who is the founding artistic director of JOYEMOVEMENT Dance Company, and she will present “Fit the Description,” a powerful solo danced by Emmanuel Mallette that examines the experience of being a suspect because of one’s association or physical appearance. From complex relationships to minimalist movement, the festival presents the wide variety of contemporary modern dance being created in North Carolina. Parking is available near the theater, in the Church St. and Davie St. parking decks, or on the street. General admission tickets are $20, and it’s $15 for students or seniors and $10 for children under 10 and for groups of 10 or more. In honor of this special first performance in the Van Dyke Performance Space, a limited number of Patron Tickets are available for $35 each; these include reserved seats with the best sight-lines and an invitation to a pre-show cocktail hour with the dance artists and community leaders. For ticket reservations visit http://ncdance.brownpapertickets.com. Tickets will also be available through the Dance Project website: www.danceproject.org/festival and at the box office the night of the performance. Lindsey Kelley Brewer will also teach a free, open-level Modern Technique and Repertory master class on November 12 from 12-2pm (Greensboro Cultural Center, Studio 323). Find out more about upcoming classes, artist talks, and more on the website: www.danceproject.org. To view a schedule of upcoming GPS events – including the two exhibition openings visitors will enjoy at downtown’s First Friday later this week – visit greensboroprojectspace.com. Thursday, Nov. 3, is GEAR UP (Gaining Early Awareness and Readiness for Undergraduate Programs) Day at UNCG, when the Student Success Center, Enrollment Management and Student Support Services host seniors from at-risk high schools on UNCG’s campus, to prepare them for the college environment. Presenters from Admissions, Financial Aid, and the Career Center will share information with the attending high school students, who have applied to college or are in the process of applying. The students will also have the opportunity to hear from a faculty panel. This is the second year UNCG has hosted GEAR UP day, and was awarded a grant through UNC General Administration for the event. The Faculty Senate will meet today (Nov. 2, 2016) at 3 p.m. in the Virginia Dare Room, Alumni House. Chair Anne Wallace and Provost Dana Dunn will provide remarks. There will be continued discussion of “How the Senate Does its Work” as well as “Prepare for Chancellor visit February 1, 2017,” led by Wallace and Andrea Hunter, chair-elect. At 4 p.m., there will be a Budget Committee report and survey collection led by George Michel, Budget Committee chair. Afterward, David Carlone, General Education Council chair, will lead the General Education review, report and discussion. There is an upcoming Faculty Forum, “Equity, Diversity & Inclusive Excellence at UNCG” November 16, 3-5 p.m. in the Virginia Dare Room. The guest facilitators will be Julia Mendez Smith, chancellor’s fellow for Campus Climate and Gerald Holmes, chair of the Faculty Senate Committee on EDI in partnership with Chair-Elect Andrew Hunter and members of the EDI committee. The next meeting of the Faculty Senate will be December 7, 3-5 p.m. in the Alumni House, Virginia Dare Room. UNCG’s North Carolina Network for Safe Communities (NCNSC) has partnered with John Jay College and the High Point Police Department (HPPD) in the recently launched National Intimate Partner Violence Intervention Initiative (NIPVII), a program which, in June, received a $1.6 million grant from the Department of Justice’s Office on Violence Against Women (OVW). The grant was awarded to replicate a strategy originally implemented in High Point, NC and replicated in Lexington, NC, to combat intimate partner domestic violence (IPDV). For five years Dr. Stacy Sechrist and Mr. John Weil, of the NCNSC under the UNCG Office of Research and Economic Development and Vice Chancellor of Research and Economic Development, Dr. Terri Shelton, have worked with the High Point Police Department, the High Point Community Against Violence (HPCAV), the National Network for Safe Communities, and other partners to develop, implement, and evaluate the “Offender Focused Domestic Violence Initiative” (OFDVI), as it is called in High Point, and the replication of the strategy in Lexington, NC, which was funded by a grant from the Community Oriented Policing Services (COPS) Office). At five years in action, the High Point OFDVI initiative has been extremely successful, and has gained national attention. It has also been implemented in other cities and counties throughout North Carolina. IPDV-related victim injuries and calls have declined in both High Point and Lexington since the implementation. The “focused deterrence” model was originally developed by David Kennedy at the John Jay College of Criminal Justice, and was first used to reduce gun and street gang violence in Boston. The model has since been adapted and applied to reduce violence associated with various crime dynamics, including chronic violent offenders, gang or group-related violence, violence associated with open air drug markets and now to intimate partner domestic violence. The OFDVI strategy relies heavily on participation from the community, building accountability, transparency and trust to ensure a swift response toward IPDV offenders. Information concerning IPDV offenses is closely tracked, and offenders are classified specifically in order to deliver clear and effective deterrence messages. Assistance services to enact positive life changes, such as educational opportunities, substance abuse treatment, mental health treatment and community resource access, have also been made more available to improve victim and offender outcomes. The strategy also seeks to avoid re-victimization through identifying and resolving systematic barriers in the judicial process. The National Network of Safe Communities (NNSC) will continue its work in partnership with police, prosecutors, probation and parole officers, victims’ advocates, social service providers, and community members to protect and support victims in each of the selected cities, and UNCG will assist in its implementation and assessment. On Saturday, Nov. 5, dig into Public Archaeology Day at the David Caldwell Historic Park. The event, which is free and open to the public, features fossil casts, ground penetrating radar demonstrations, replicas of Greek and Roman artifacts, kids’ activities and posters by UNCG archaeology faculty showing their work in Greece, Syria, Turkey, Africa, Peru and the Triad. According to Classical Studies professor and event organizer Dr. Joanne Murphy, the event will show how students are included in UNCG archaeology research and will reveal “what we share with our ancestors and how we have changed.” Attendees will have the opportunity to meet UNCG archaeologists and Greensboro historians, and will find out how archaeology is accessible locally. Public Archaeology Day runs 1 to 4 p.m. at the David and Rachel Caldwell Historic Park, located at 3211 W. Cornwallis Dr. in Greensboro. It is co-sponsored by the Greensboro Chapter of the Archaeological Institute of America, UNCG Archaeology Program, and the Greensboro Historical Museum. UNCG Volleyball earned a victory over the ETSU Buccaneers on Saturday evening inside Fleming Gymnasium, with a spirited crowd on hand. UNCG improved to 8 wins, 3 losses in the Southern Conference. ETSU entered the match with the top record in the SoCon with two weeks remaining in the regular season. ETSU, still in first place, falls to 9-3 in the SoCon, currently one-half game ahead of UNCG in the standings. The Spartans snapped ETSU’s eight-match winning streak, and have won eight of their last nine matches, including six-in-a-row. UNCG returns to action this Friday, Nov. 4, as it hosts The Citadel at 7 p.m. The match will be broadcast on ESPN3. Admission is free. See a 30-second highlights clip from last Saturday’s match. 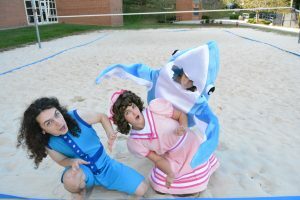 UNCG’s North Carolina Theatre for Young People will present “Pinkie and Blue” over two weekends and one week in November. In this imaginative play written by Jim Wren and Joe Sturgeon and directed by Jim Wren, two paintings, Pinkie and The Blue Boy, are brought to life and travel through the landscapes of some of the most famous paintings in history. Their journey takes them through Van Gogh’s “Starry Night,” Rousseau’s “Sleeping Gypsy,” Chagall’s “Circus,” Degas’ “Dance Rehearsal” and Lautrec’s “Can-Can.” Will Pinkie and Blue make it back to their frames? The show runs Nov. 11-18 with showtimes at 9:30 a.m., 12 p.m., 2 p.m., and 7:30 p.m. All performances are in the Taylor Theatre, at 406 Tate Street. The 2 p.m. Nov. 12 performance will be followed by a family friendly tea party with the cast, and guests will receive cider hot cocoa, tea and seasonal treats. Guests are encouraged to bring cameras to take pictures with the costumed cast members. The 7:30 Nov. 11 show will be a “pay what you can” preview. Tickets for the show and tea party may be purchased at the box office at 402 Tate Street in room 115 of the Brown Building, through Triad Stage’s website, or by calling 336-334-4392. Dr. Linda Hestenes (Human Development and Family Studies) received a continuation of funding of nearly $3.5 million from the NCDHHS Division of Child Development for the project “North Carolina Rated License Assessment Project.” The purpose of this contract is to conduct activities related to the assessment portion of the NC Star Rated License, including receiving requests from Division of Child Development and Early Education consultants, scheduling assessments, conducting valid and reliable assessments, delivering assessment scores and reports, responding to grievances, and conducting outreach sessions. Dr. Holly Sienkiewicz (Center for New North Carolinians) received new funding from the New Arrivals Institute for the “Refugee After School Program.” An after-school tutoring program, social enrichment activities, and ESOL and employment readiness are provided at two CNNC community centers that provide services to refugees. We are pleased to announce that both early and election-day voting will be available on our campus this year. Weekday (M-F) hours for both sites are 8:00 am – 6:30 pm. Weekend times vary; please consult the complete listing of early voting sites and hours for more information. Please note: Though the Kaplan Center will be open earlier than usual for voting purposes on Saturdays, access to the fitness facilities will operate according to the regularly scheduled hours. An election day polling site will be open on Tuesday, November 8, 2016 from 6:30 a.m. until 7:30 p.m. in the Campus Ministries Building, located at the corner of Stirling and Walker Streets. Please refer to the State Board of Elections website for official information regarding your individual registration status and election day polling location. Transportation: Due to very limited parking at both locations, we strongly encourage the use of alternate transportation including walking, biking or riding the Spartan Chariot; options are described in the “Getting Around Campus” section of the Parking Operations & Campus Access Management website. Students: Additional voting information specific to students can be found at the UNCG VOTES website. Employees: In accordance with UNC Policy 300.5.1, N.C. General Statute Section 126-13, and the Office of State Human Resources’ Policy on Community Service Leave, individual voting and election staffing is not covered activity under community service guidelines. Except for the one defined activity outlined in Section 5, Page 17 of the State Human Resources Manual (provision of unpaid assistance to voters inside a polling place), staff who choose to participate in the election process during their normal work schedule are required to take annual leave. Those employees who are required to staff the event as part of their official responsibilities (e.g., Kaplan facilities staff) should record their time as time worked. Staff are urged to check with their supervisors if they have any questions. Any remaining questions specific to UNCG’s voting sites can be directed to Nikki Baker, Director of Federal & External Affairs, at (336) 209-1643 or nikki.baker@uncg.edu. General inquiries related to voting registration, process, requirements or regulations should be directed to the Guilford County Board of Elections at (336) 641-3836. We appreciate your patience and support as we provide this important service to our community. 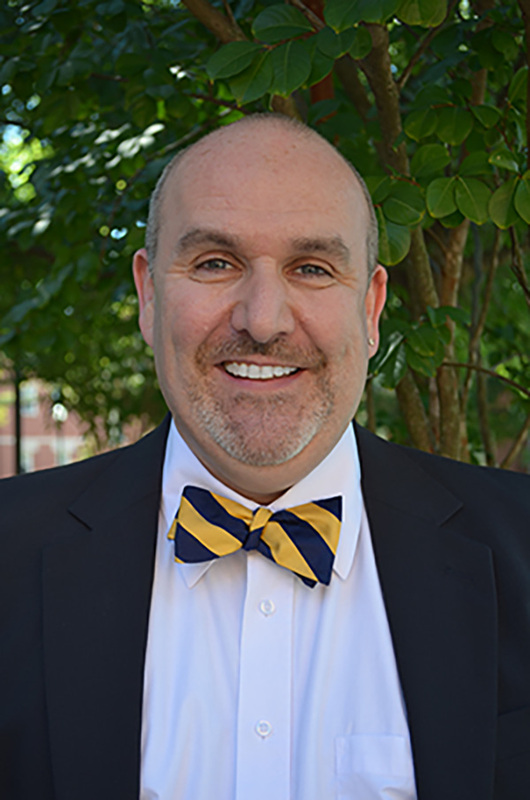 Dr. Brad Johnson (Teacher Education & Higher Education) has been recognized as a member of the 2017 Diamond Honoree class by ACPA-College Student Educators International. The Diamond Honoree Program, established by the ACPA Foundation in 1999, is both a recognition program and a fundraising activity. Those nominated for consideration are recognized for their outstanding and sustained contributions to higher education and to student affairs. More information on the Diamond Honoree program can be found at http://foundation.myacpa.org/whatwedo/diamond-honoree/. Dr. Chris Payne (Center for Youth, Family and Community Partnerships) received new funding from Sandhills Center, LME, for “Specialty Courts Staff Support.” This is supported by funds from Guilford County. Faculty are being asked to review these themes in the University Plan and consider responding to one of the three RFPs available to provide seed funding for teaching innovations or research tied to the Strategic Plan. These grants are designed to help faculty engage in multidisciplinary endeavors in order to advance understanding of key factors related to these themes and/or solutions to some of the major challenges. The attached RFPs contain more information on the application process and the mechanism and criteria for review. Please note any requirements in the RFPs regarding collaboration across disciplines. Questions should be directed to the individuals indicated in each RFP. All proposals are due by December 9, 2016; decisions will be announced by February 3, 2017. Go to http://research.uncg.edu/seeking-proposals-strategic-seed-grants/ for links to the three seed grants listed below, including guidelines and the cover pages. A link to the University Plan referenced above can also be found on that page. Dr. Paul Luebke died Saturday, Oct. 29. An associate professor, he had been a member of the Department of Sociology at UNCG since 1976. He began teaching at UNCG after spending time teaching at Tougaloo College and at UNC Chapel Hill. At UNCG, he taught courses in political sociology, media, social movements and international social problems. He was a public sociologist, actively engaged in sharing his knowledge of the political structure with others. He was a frequent presenter at the Mid-South Sociological Society and Southern Sociological Society annual conferences. He was consistently quoted in and interviewed for North Carolina newspapers and the Associated Press. Since 1991, Luebke had been a member of the North Carolina General Assembly, representing the 30th House District. In July 2016, he was honored for serving 25 years in the North Carolina Legislature. He was also the author of two books about North Carolina politics, “Tar Heel Politics: Myths and Realities” (1990) and “Tar Heel Politics 2000” (1998), and wrote several book chapters on the topic of politics in the South. The UNCG College of Arts and Sciences’ Ashby Dialogues, co-sponsored by the departments of Anthropology and Sociology and the African American and African Diaspora Studies program, will discuss the work of award-winning author Claudia Rankine on Tuesday, November 15, at 12:30 pm. According to a New York Times article on her book “Citizen: An American Lyric,””Rankine brilliantly pushes poetry’s forms to disarm readers and circumvent our carefully constructed defense mechanisms against the hint of possibly being racist ourselves.” Her critically acclaimed book has recently earned her the honor of a MacArthur Genius Grant. She will join the attendees via Skype in 186 Stone Building. An excerpt of her work has been uploaded to the Canvas Ashby org and is now available. Contact Dr. Tara T. Green for more information. The Philosophy Department hosts a Great Conversation “Nudges and Choices: The Technological Mediation of Moral Decision Making” on Thursday, Nov. 10, at 5:30 p.m. in the Faculty Center. It will be led by Prof. Adam Rosenfeld, Dept of Philosophy. All are welcome. Light refreshments will be served. Season tickets are on sale for UNCG Men’s Basketball. There is a discount for UNCG faculty and staff. Faculty/Staff members can purchase Lower Level season tickets for as low as $99 per ticket. Home games include the ACC’s Virginia and Wake Forest., North Carolina A&T State, and the entire Southern Conference. For information, contact Adam Rich, director of Athletic Ticket Operations, at alrich@uncg.edu or 336-334-3250. Undergraduate Admissions is holding a fall open house for high school juniors and seniors Saturday, November 5. This event, Spartan Showcase, attracts prospective students from all over North Carolina and the East Coast. “Students and families are always excited to talk with faculty and staff who attend Spartan Showcase. On behalf of Undergraduate Admissions, I would like to thank all of you who have volunteered for this year’s event or have helped us in the past. Getting campus ready for visitors and making students feel welcome is truly a team effort at UNCG. “Some of you may be planning to attend Spartan Showcase with your own prospective student. I hope you find the experience to be fun and informative. Students will receive an email survey after the event, but if any of you have additional feedback to pass along, I would love to hear from you. More information about Spartan Showcase is at UNCG Now. The rankings are based on institutional data – including the percent of students and faculty from underrepresented minority groups – and student answers to survey questions. In addition, the Bryan School was included in the Best Business Schools – Southeast listing. “The Best 294 Business Schools” is based on the survey responses of the approximately 25,000 students attending the 294 business schools included in the book. Tickets are available for the 2016 Women Veterans Historical Project Annual Luncheon on November 12. The event will be 11:30 a.m.-2 p.m., Saturday, Nov. 12, in Cone Ballroom, Elliott University Center, UNCG. For nineteen years, the Betty H. Carter Women Veterans Historical Project (WVHP) in the University Libraries at UNCG has recognized the contributions of women veterans with a November luncheon. This year’s program features a moderated point/counterpoint discussion between Jude Eden and Kate Germano, Marine Corps veterans who have differing views about women in combat roles in the U.S. military. There will also be an exhibit of uniforms and other selected items from the collection. The purpose of the luncheon is fourfold: to honor the service of women who served in the United States armed forces and the American Red Cross; to serve as an educational forum about women veterans; to engage the veteran community at UNCG and Greensboro; and to highlight the work of the WVHP and its ongoing oral history project. An exhibit of military uniforms and other materials from the WVHP collection begins at 11:30 a.m. The luncheon and program will begin at 12 noon. This is a ticketed event which is open to the public. Tickets are free for UNCG military affiliated students (veterans, reservists, active military), $18 (suggested) for all other veterans and $22 for non-veterans. Table sponsorship opportunities to support student attendance and veterans with limited means will be available for $350. Please make your luncheon reservations and table sponsorships by Nov. 1. For disability accommodations or other questions – and to make reservations – contact Beth Ann Koelsch at bakoelsc@uncg.edu or 336/334-5838. Visual: WAVES pass in review, 1946; photo courtesy UNCG Archives. Driven by a powerful belief in the value of free expression, Sheryl Oring, UNCG assistant professor of art, has spent more than a decade helping people across the country voice concerns about public affairs through her “I Wish to Say” project. Her latest publication, “Activating Democracy: The “I Wish to Say” Project” (Intellect, 2016), uses that project as the starting point to explore a series of public interest issues being addressed by artists today. The book features essays by contributors ranging from art historians and practicing artists to scholars and creators working in literature, political science, and architecture. The Thursday, Oct. 27, event, which is free and open to the public, begins at 6:30 p.m. with a special book release and a performance by Oring and UNCG students in the museum atrium, followed by a presentation and discussion with Oring and contributing book essayists at 7 p.m. Visitors will be invited to dictate postcards to the next president. The North Carolina-based contributors who will discuss their essays are Lee Walton, associate professor of art at UNCG; Dr. David Holian, associate professor of political science at UNCG; George Scheer, founder of Elsewhere, a living museum in downtown Greensboro; and Dhanraj Emanuel, a Greensboro-based photographer. A reception immediately follows and books will be available for purchase. Free and open to the public. Frights are afoot on campus. See details below for UNCG events: spooky artifacts, a haunted house, family event, ghost hunting and a Halloween organ recital. Archivists from UNCG and Wake Forest University will present a special, spooky Hops into History at Gibb’s Hundred Brewing Company on Thursday, Oct 27. You’ll have a chance to see some of the creepiest items from both library collections, such as death masks, Victorian poetry, frightening illustrations and a pair of “dead man’s boots.” Coloring books for kids and doggie treats for any visiting history hounds. Baconessence food truck will be there from 6 to 9 p.m. The event begins at 5 p.m. and Gibb’s is located at 117 W. Lewis St in downtown Greensboro. Several departments in University Libraries have decorated witches’ hats for their annual contest and University Libraries invites you to help choose a winner. Please “like” your favorite entry on the University Libraries Facebook post by Thursday, Oct. 27, at 10 a.m. – or stop by Jackson Library to vote. On Friday, 7 to 10 p.m., all students are invited to Kaplan Commons to enjoy a Candy Land-themed Halloween festival. There will be custom glow-in-the-dark t-shirts, a horror movie poster photo booth, carnival games, food, music and more. Ashby Residential College will open its annual large-scale haunted house Saturday, Oct. 29, 7 p.m. to midnight in Mary Foust Residence Hall at 301 College Ave. It’s $5, or $3 with a canned food item, to enter the haunted toy factory. All proceeds benefit the ARC of Greensboro and the Spartan Pantry. All are welcome. Ghost expert Chris Fleming will tell his story of growing up in a haunted house and witnessing the appearance of ghosts and spirits. He’ll then lead the audience on a campus ghost hunt. Saturday, Oct. 29, 8 to 10 p.m. starting out in the EUC Auditorium. This event, sponsored by Campus Activities and Programs, is open to all students, who should bring IDs. The UNCG Organ Studio will present its annual Halloween organ recital, “Spooktacular,” Monday, Oct. 31, at 7:30 in the Music Building’s Organ Hall. This concert is open to the community and admission is free. “Decade by Decade: Art Acquired in Its Time,” a new exhibition at the Weatherspoon, presents “art of the now” from each decade since the museum opened in 1941. Curated by Elaine Gustafson, the exhibition is quintessential to the Weatherspoon Art Museum. The museum’s founder, Gregory Ivy, always advocated for “art of the now,” so that UNCG and the Greensboro community could experience art that was truly of their time. All the pieces featured in this current exhibition entered the collection shortly after being produced, which means they hadn’t been vetted by critics and art historians. Sometimes these works were made by very young artists and the Weatherspoon was the first museum to ever purchase their work. Among the many notable pieces, “Decade by Decade” includes (Annie) Elizabeth Beall’s “Bus Station” (1943), Alexander Calder’s mobile, “Yellow Sail,” (1951), Lee Lozano’s “Clash” (1965), Philip Pearlstein’s “Female Model in Red Robe on Wrought Iron Bench (1972), Nancy Grossman’s “A” (1981), Robert Colescott’s “A Visit from Uncle Charlie” (1995), Amy Cutler’s “Saddlebacked” (2002) and Ursula von Rydingsvard’s “Spoon-Ladle” (2011). “It’s a very select idea of the history of art in the last half of the twentieth and the twenty-first century,” Gustafson says, and adds that it shows “constant tension between abstraction and figuration.” These are works that could be featured in top museums in New York City or L.A., but instead they’re available to UNCG and the Greensboro community, thanks to the Weatherspoon curators, staff and donors. “Decade by Decade” runs through December 23. The museum is open Tuesday, Wednesday and Friday 10 a.m. -5 p.m., Thursday 10 a.m.- 9 p.m., and Saturday and Sunday 1 p.m.-5 p.m.
On Nov. 3 at 6:30 p.m., enjoy a screening of a documentary about one of most widely known artists in Decade by Decade, Eva Hesse, with a Q and A with the filmmaker. To recognize outstanding achievement in scholarly activities, the university bestows up to two Research Excellence Awards each year. The Junior Research Excellence Award is for a scholar at the rank of assistant or associate professor and a cash honorarium of $4,500 accompanies the award. The award is based primarily on work done at UNCG during the past five years. The Senior Research Excellence Award is for a scholar at the rank of professor and a cash honorarium of $7,500 accompanies the award. The award will be made on the basis of the nominee’s research career, with particular emphasis placed on work done in the last five years. To nominate a faculty member for the 2016-2017 Research Excellence Award, go to http://research.uncg.edu/research-excellence-awards/ for a copy of the Nomination Packet which includes the nomination guidelines, selection criteria and the nomination cover sheet. All materials are to be submitted electronically. The Nomination Packet, including the signed nomination cover sheet, should be scanned as a pdf file and emailed to rsh_ptnr@uncg.edu by December 5, 2016. For more information, contact Debbie Freund in the Office of Research and Economic at freundd@uncg.edu or 336-256-0426. The UNCG Bryan School of Business and Economics presented Steven Strader with the 2016 Distinguished Alumni Award during the annual Emeritus Advisor Society and Awards Dinner in September. This annual award is presented to alumni who have achieved outstanding success in business. The award recognizes exceptional achievement and significant contribution to the recipient’s profession and to the business community. Steve Strader (left, with Dean Banks) received both his bachelor’s and master’s degrees in business studies from the Bryan School. His career began in corporate and commercial banking, where he spent 20 years in progressively responsible positions with NCNB, NationsBank, and Bank of America. He moved to the automobile industry as Chief Financial Officer with Driver’s Mart Worldwide where he helped build an impressive company that was later acquired by AutoNation, a Fortune 200 company and America’s largest automotive retailer. He served as President of both the Colorado and Midwest markets before moving on to become Senior Vice President of Retail Operations, having responsibility for new and used vehicle sales on a national level, overseeing over 300 dealerships, vehicle pricing, car and truck inventories, associate performance development, and finance and insurance. He embodies the UNCG motto of “Service.” His many philanthropic and volunteer causes have included SafeHouse Denver, Horses and the Handicapped of South Florida, Boy Scout Council of Sarasota County, The Hundred Club – an organization that supports firefighters and law enforcement officers and their families, The Economic Council of Palm Beach County, the United Way of Broward County, Racing for Cancer, and the Dolphin Cycling Challenge. He also serves on the Dean’s Advisory Board within the Bryan School. The panel “Race and the University: Black Lives Matter” will be held on Thursday, Nov. 3, at 5 p.m. in Cone Ballroom C of the EUC. The panel and discussion will address the implications of the Black Lives Matter movement for thinking about the internal life and social role of the university, says Dr. Mark Rifkin, director of the Women’s and Gender Studies (WGS) Program and professor of English. It is co-sponsored by UNCG WGS and UNCG AADS. Leave Management 101 will answer your questions regarding leave – when to use what, and how to interpret the policy in regards to your department. Various types of leave include, but are not limited to: adverse weather, holidays, compensatory (comp) time, vacation/sick leave, community service, civil leave and voluntary shared leave. This workshop with Human Resources’ Marcia Rey and Rhonda Rogers will be held on Friday, October 28, from 10am-12pm. Human Resources’ Deb Carley will present a workshop, Time Management, on prioritizing your needs and your departmental needs while helping you identify time wasters. This workshop will offer tips on using a “Priority Matrix” as well as the use of a 5-step method to assist with time management. This workshop is offered on Wednesday, November 2, from 9am-11am. UNCG’s Human Resources provides an informative workshop on Managing Personnel Action Forms: SHRA and EHRA Non-Faculty Employment. This workshop on Thursday, November 3, from 10am-12pm will provide a primer on temporary and permanent personnel action forms. This important procedural review will consist of the when and how to utilize available personnel action forms and EPAFs to ensure timely pay. This workshop is provided by Kathy Watford, Human Resources Specialist for SHRA Temporary; Marcia Rey, Human Resources Specialist for EHRA Non-Faculty, and Rhonda Rogers, Human Resources Specialist for SHRA Permanent. **Please note that there is a recommended prerequisite for this workshop: Banner HR: EPAF and PAFs. A workshop on the Teachers’ and State Employees’ Retirement System (TSERS) is designed to help mid to late career employees see what resources are available to you. Emily Foust, UNCG’s Benefit Manager, will discuss retirements in her TSERS: Retirement Workshop. Feel free to bring your spouse or partner with you. Please register for you both as seating is limited. This workshop will take place on Monday, November 7th from 1 pm-2:30 pm in Forney 112. Hiring series: An important aspect of hiring requires finding the right candidates. Human Resources’ Benita Peace discusses Recruiting for Success: Safe Hire Practices. Within this workshop, you will find available resources, discuss the benefits of successful hiring and the pitfalls of not carefully selecting candidates. This workshop takes place on Friday, November 4th from 2pm-4pm. Hiring series: Another important aspect of finding the right candidate in your recruitment search, is having the right tools to advertise and garner applicants. Join our UNCGjobsearch expert, Natalie Jacobs, as she presents a series on UNCGjobsearch. The November workshops series begins on Tuesday, November 8th, from 11:30am-1pm and concludes on Thursday, November 10th 11am-12:30pm and are on Creating a Posting for EPA/SPA, Review and Transition of Applicants, and Creating a Hiring Proposal. Seats are limited, so please register today. Hiring series: An important aspect of hiring is having the right interview techniques. Come to a workshop with Deb Carley, Interim AVC for Human Resources, as she presents on Behavioral Interviewing. The workshop will explore the best techniques for the interview process in order to hire the best person for the job. Several areas that will be covered include: how to evaluate past behavior to indicate future performance, the best way to use open-ended questions without theoretical (“What if”) questions, and how to frame the questions so there are no legal ramifications. This workshop is offered on Tuesday, November 8th from 9am-11am. Dr. Omar Ali will show in his three-part workshop, Transforming the Workplace through the Power of Play, that play is one way for you as an employee to become happier and more efficient in the workplace. Come learn through the latest in research in psychology, business, and improvisation, and through interactive exercises that will build your self-confidence and interpersonal skills. It is recommended, as each of the workshops build upon each other, to attend all three workshops on Mondays: November 4, November 21, and November 28 at 11:30am-12:45pm in the Faculty Center. Join Wade Maki, Senior Lecturer in the Department of Philosophy, as he provides a fun and thought-provoking workshop on ethics. Practical Ethics: Professional Life Beyond the Legal Minimum helps us cope by providing tools and useful solutions to real life situations found here at UNCG. This workshop will be held on Thursday, November 10th from 2pm-4pm. New offering: From the Vice Chancellor of Business Affairs Office, Macea Whisette is offering a new workshop on presentations. In Conversational Presenting 101, participants will learn different strategies to enhance their personal presenting styles for increased engagement and participant satisfaction. This workshop will be held on Tuesday, November 15, from 9:30 am-10:30 am. Persuasion is a skill that everyone in the organization uses to accomplish goals. Used effectively, persuasion can lead to solutions that work in everyone’s best interest. Pushing important tasks and projects off until later can cause emotional anguish and keep you from accomplishing professional and personal goals. This workshop will provide you with techniques and strategies to overcome procrastination in your work and personal life. When surrounded by clutter, it is impossible to focus or have clarity about life. In this workshop you will learn that clutter is not the result of sloppiness, laziness or incompetence but several surmountable obstacles. Recognizing the source of your clutter problem can empower you to address the problem directly and without shame. Our ability to remember things is one of the most useful tools we have in our work and home lives, but the amount of things we are trying to remember at once can sometimes be overwhelming. Memory is a skill, and like any skill, with practice it can be developed and improved.